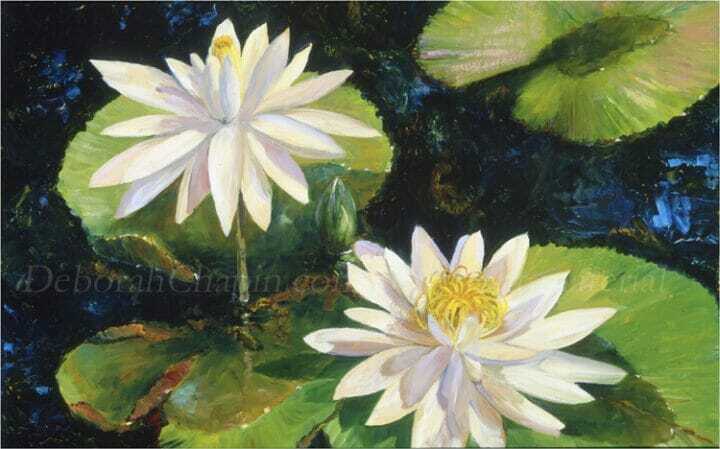 Tags: floral art, floral artwork, floral canvas prints, floral paintings on canvas, flower paintings on canvas, flowers painted on canvas, image of floral artwork, white water lilies, white waterlilies. Read the whole story: “I painted this piece on location over a series of days from these night blooming tropical white water lilies at dawn when the sun was just beginning to pop up its head just as the blossoms start to close. I painted the same blossom three days in a row to show it as it first blossomed, full flower, and as it began to go by. ” The water was painted with impasto in pallette knife. This painting exhibited at the Rudolf Schaffer Museum in Mystic CT this piece was also published in a full color catalog published by the American Society of Marine Artists. This piece was the transition piece between the nautical artwork and my era of plein air painting. The original is 18×24 and is Sold but and unframed printed canvas with permanent pigment ink are made to order ready for your framer for the same size. Made to order prints are printed on demand with the highest quality materials by the artist. Deborah wanted to keep control of her quality of materials and the reproduction of truly beautiful colors. Deborah is a long time professional artist who has lectured at the Smithsonian American Art Museum on color and plein air painting and has exhibited her works in museums worldwide.